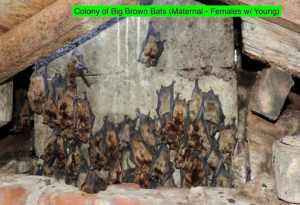 WNCPC specializes in the removal and management of bats from buildings. We keep them out for good. Bat management is very complex process effectively resolve. A very detailed inspection of the structure in order to determine species and why the bats are inside the structure is the first step. Effective bat management means understanding the biology and life cycle of bats, construction principles of the property, familiarity with the use of ladders and safety equipment. Many tools are necessary to properly seal the structure. All of this is required while at the same time not trapping bats inside the structure! Bats must be allowed to leave the structure through one-way devices and not return. Those one-way devices should then be removed after all bats have left. Every single crack and crevice big enough for a bat to fit in needs to be sealed! We seal all gaps that are the thickness of a pencil by an inch and a half or larger! A bat bug (family: Heteroptera) ectoparasite feeding on part of the wing of a big brown bat (Eptesicus fuscus). Bats have the potential to carry ectoparasites such as fleas, ticks, mites, bat bugs, bat ticks. Ectoparasites have the potential to infest the home, especially after the bats have left the structure. 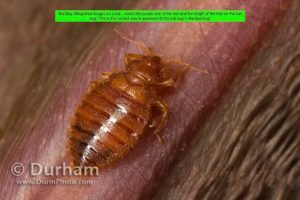 Licensed through the Colorado Department of Agriculture we are able to treat these homes for ectoparasites. 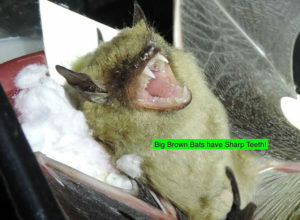 We utilize BCI (Bat Conservation International) certified methods. The owner, Gerrod Walker, is certified by NWCOA (National Wildlife Control Operators Association / Bat Standards Certified). By following NWCOA and BCI’s best management practices, there are reduced chances that bats will be trapped inside the structure and die. Young bats (aka pups) won’t be left abandoned and that the job is completed in the most effective and efficient way. The Colorado Parks & Wildlife and the Colorado Department of Agriculture agrees with these methods as well. With the backing of the CPW, CDA, NWCOA Bat Standards and the BCI, you can be sure that our guidelines will result in the most effective control possible. Our company is poised to handle nearly any bat situation that arises, no matter how complex or difficult the situation may be. We have effectively removed colonies from single family residences on up to large scale commercial and government buildings. Inspecting exterior of the structure and photographing the site. Accessing and investigating attic spaces for damage (if safe to do so). Evaluating life cycle that the bats are using structure for (Maternal / Nursery Colony, Overwintering, Occasional Roosting etc). Inspecting to determine potential entry into the living spaces, and evaluating entry points such as window a/c units or vents. Lengthy consultation with the property owner or facility manager about bats and bat management efforts. Building a bat management plan for your custom situation. A bat inspection report is then generated and provided to clients electronically in digital format. Photographs taken during the inspection are also provided to clients electronically. Inspections are variably priced, depending on your location (and other factors). Call us or click on “contact us page” for further information or to setup an appointment for inspection.